Step back into the unforgettable world of Rapture in BioShock 2. 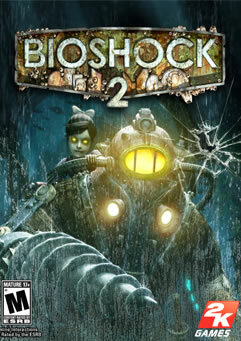 Developed by 2K Marin, 2K Australia and Digital Extremes, BioShock 2 provides players with the perfect blend of explosive first person shooter combat, compelling storytelling and intense multiplayer. Set approximately 10 years after the events of the original BioShock, the halls of Rapture once again echo with the sins of the past. Along the Atlantic coastline, a monster has been snatching little girls and bringing them back to the undersea city of Rapture. You are the very first Big Daddy as you travel through the decrepit and beautiful fallen city, chasing an unseen foe in search of answers and your own survival. • Genetically Enhanced Multiplayer – Earn experience points during gameplay to earn access to new Weapons, Plasmids and Tonics that can be used to create hundreds of different combinations, allowing players to develop a unique character that caters to their playing style. • Experience Rapture’s Civil War– Players will step into the shoes of Rapture citizens and take direct part in the civil war that tore Rapture apart. • See Rapture Before the Fall – Experience Rapture before it was reclaimed by the ocean and engage in combat over iconic environments in locations such as Kashmir Restaurant and Mercury Suites, all of which have been reworked from the ground up for multiplayer.